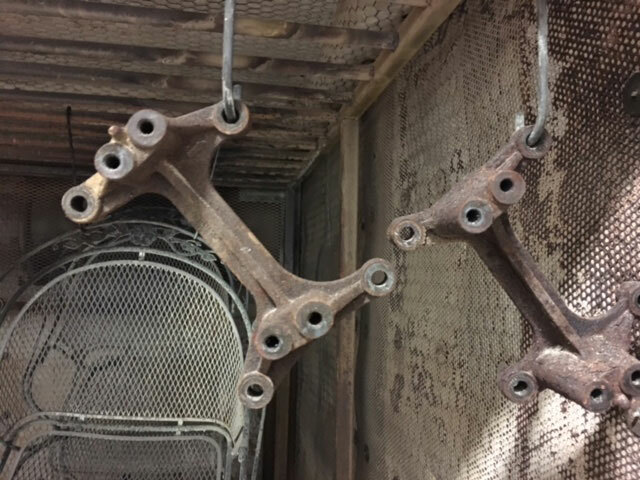 At Hanover Powder Coating, one of the methods we have available for removing cured powder coatings includes burning or baking off the old coatings. 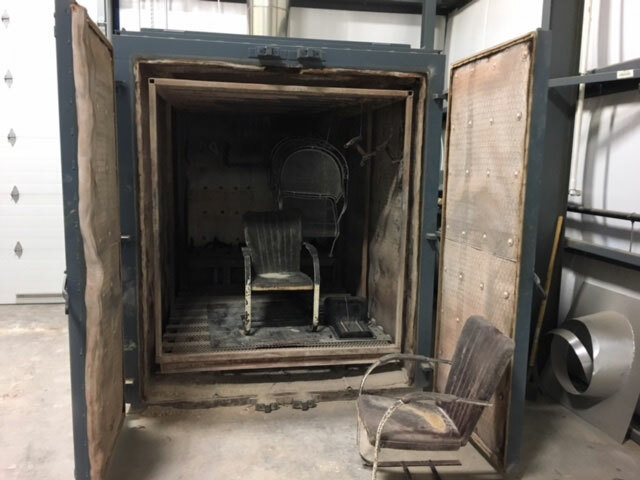 If a part has an old finish, several finishes, or a heavy powder coating, a fast option for cleaning the parts for powder coating is to place them in a burn off oven and literally turn the existing finish into ash. The only exception is when a part requires spot repair. In this case, the defect area is usually sanded to bare metal, feathering the edges to ensure that the area will blend into the surrounding surface. The part should be processed and fully covered after sanding to complete the repair. Liquid touch up paint can be substituted for the powder coating if the repaired area is relatively small. Thermal paint stripping methods use heat to breakdown the coating and turn it into an ash residue, usually removed by water or a quick pass from media blasting. 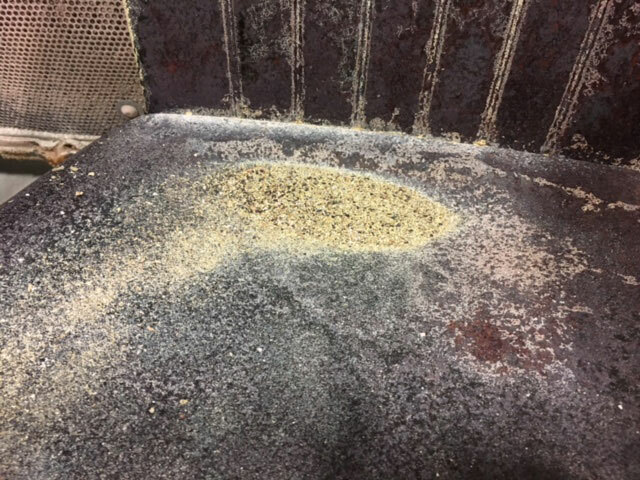 There are three types of thermal cleaning methods: bake-off; burn-off; and fluidized bed. At Hanover powder coating, we offer the bake off and burn off methods with our burn off oven. The important thing to remember is that this method of stripping requires the parts to be able to withstand the temperatures involved in the process. Parts that are made of magnesium or have soldered joints would not be good candidates for this stripping process, since temperatures can be as high as 1,200F. Bake-off stripping systems are batch-type processes where parts and/or hangers/racks are loaded into the oven for cleaning. The oven temperature is set between 650-750F, which is generally the temperature where the coating will degrade and eventually ignite. This is an environmentally friendly method because the smoke, soot, and other byproducts of this process (VOCs) are destroyed by afterburners in the exhaust stack. These ovens usually employ water-misting systems to control the rate of burning and prevent damage to the equipment or parts being stripped. 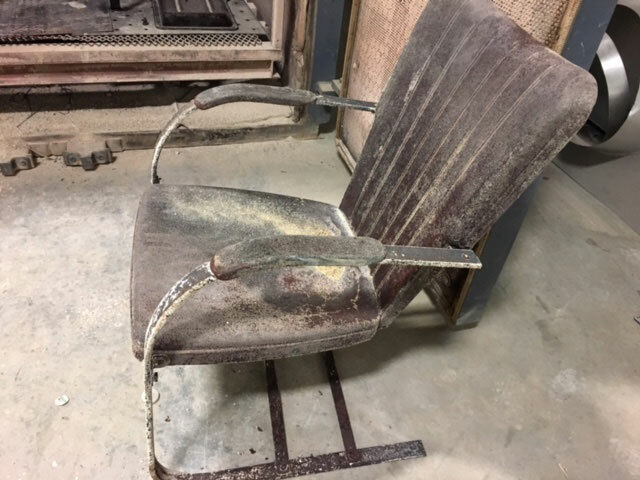 This process will not completely strip the product to bare metal, and the residual ash must be removed to prevent fouling of subsequent pre-treatment, coating, and curing processes. Burn-off stripping systems expose the products to be stripped to much higher temperatures, between 1,000-1,200F. At these temperatures, the coating ignites quickly and literally burns away from the product. Water quenching is used to extinguish the fire and to remove the residual ash. This means the products are completely cleaned when they are finished. Discretion of the operator is important as some parts can get warped. Advantages of burn off or bake off paint stripping are that they are a fast and excellent choice for dirty or greasy parts such as chassis and engine parts as the heat burns away all oils and grease. The faster we can strip the part, the less it will cost for you during the whole process. Baking and burn off is also great for cast iron decorative and patio furniture pieces that are harder to mechanically strip.